Compatible with most standard foam grip cane handles. 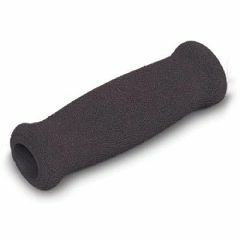 I found that the best way to replace a foam cane grip is to use a water-soluble lubricant such as Astroglide(after all, it was developed to put on space suits and wet suits). It works better than plain water, dries in a fews hours, and doesn't damage the foam. Give your cane new life! I had to cut the old foam handle off and there were no instructions on how to get the replacement on. Just trying to push the new foam grip on was impossible. A search on the net did not resolve my problem so I decided to just use tap water to lubricate the foam grip and that was the trick. The new grip went right on and the water dried up by the next day leaving the grip snug and tight on the cane. grips worked great good buy. easy to put on existing cane, just what I needed. good value. It's light, comfortable, durable but it did not fit the hand grip for my forearm crutches. I hope it is expandable(it does a little when I wet it) and one size fit all. It is great product! Bought these cane replacement grips for my son. He is very pleased with them. I have a lucite cane that is 1 inch in diameter. Will this grip fit my handle that is curved? Also will the tip fit the bottom of my cane? Thankyou. This replacement grip fit both my curved handle canes. I had to first wet them before they would slide on the canes. Is this tip suitable for a quad cane?